Road to Yellowstone East Entrance closed by mudslide Fires cause evacuations near Ketchum, Idaho. Rain does not stop the central idaho fires. Interesting email . . . . thanks Salle! These photos were taken this past Thursday, Aug. 16, 2007, on the north slope of Dunraven Pass. According to the ranger that was interviewed about this speculated that the sow had an altercation with another sow who had three cubs. This sow with two, left the scene with all four of these cubs. Nothing more is known of the fifth cub that was allegedly present at that time or the other sow. This particular sow has been seen with these four cubs over the past month. The cubs appear to be of two different ages as they are clearly two different sizes. I would offer that they may be from the same sow over two successive breeding rounds that were a little close together time-wise with her ending up raising two litters rather than one this year. Hard to tell. Didnt the Craigheads document “adoptions” back in the dump days? Good to hear that the bears are so visible from the road in the park!….. There was a year like that 3 or 4 years ago. Several sows with 3 cubs but I never saw them in following years. Its going to be a bit crowded in the den this winter…. Lovely shots. Thanks for posting them! According to Mike, the photographer, there were no other bears nearby and this was waaay out in the meadow that you can see from the road about halfway down the northern slope. We spotted a bear out there last year at this time but saw no cubs. Our lenses were not strong enough to see well as the bear was a way out there. Falcon Press has a book by Doug Chadwick and Amy Shapira that documents a grizzly adoption . . it is for kids but the story is true and the pictures are awesome. . it is coffee table book quality called “Growing Up Grizzly”. The adoption happened in Alaska at Wolverine Cove when I was a guide at Redoubt Bay Lodge. There will be more about it in my book “Lonesome for Bears” by Lyons Press coming out iin spring. I went to Dunraven yesterday, late, to see if i could catch a glimpse of the sow myself. I got close to seeing them but too many eager, uninformed tourists created an unsafe environment and ended up chasing them downslope. I did encounter Mr. Landis at one of the sites, there were also black bears in the immediate vacinity. He said he saw her in the morning on the north slope. I asked about the Craighead investigations concerning bear adoptions and he confirmed that there was such events then. Maybe I’ll venture up there later today and try again. Just got back from Dunraven. I actually saw this sow with all the cubs today. They were trotting down the sloped meadow below the Chittenden road, above the paved road, on the western slope. They hit the trees and we didn’t see them afterward. I had just pulled into one of the pullouts a little beyond where I stopped last evening and saw that the only other people there was a group from Yellowstone Safari. We all got out and looked around. I talked to them and found that they hadn’t seen anything yet. The group guide was an acquaintance and we chatted just a moment. As they got in their vehicle to leave, one of them started yelling “BEAR, BEAR! !” They all jumped out with scopes etc. I was locking up my vehicle several feet away but had my field glasses in hand. I was able to spot the gang of bears charging down the slope for a few seconds and then they were out of sight. It was so cool, we had all been there only minutes, just had a feeling to stop and check. By the time the parking area pullout was full with a traffic jam resulting, a black bear sow with a cub was trying to cross the road only a hundred yards from where we stood. I went on to the top of Chittenden and looked around up there for a little while. When I returned to the black bear crossing place, she was again trying to cross the road but there were over fifty vehicles obstructing her path with people getting out and walking right up to her. She had a cub and was looking fairly desperate by the time I caught a glimpse of her. She was walking the guardrail on a steep ridge behind her and a rock wall on the other side of the road. There wasn’t much of anywhere for her to go but along the road and the people were stopped alll along the road on both sides and the middle. This was about 3/4 of a mile north of the parking lot for the bottom of the Washburn Trail. Not a good scene for the bears. To the credit of some, several people did stop and return to their vehicles out of concern for the bear’s safety when they realized what was going on. Saw this Mom the first week of August on Dunraven. People were way too close. To her credit she was very calm. At that time she had two cubs. I’ve put this together as a keepsake story hope it is well enjoyed as I enjoyed following it and them for the spring and summer. They ‘the bear family’ were last seen still in the high country of Dunraven as of early september and I am still looking forward to seeing them at least once more before winter. 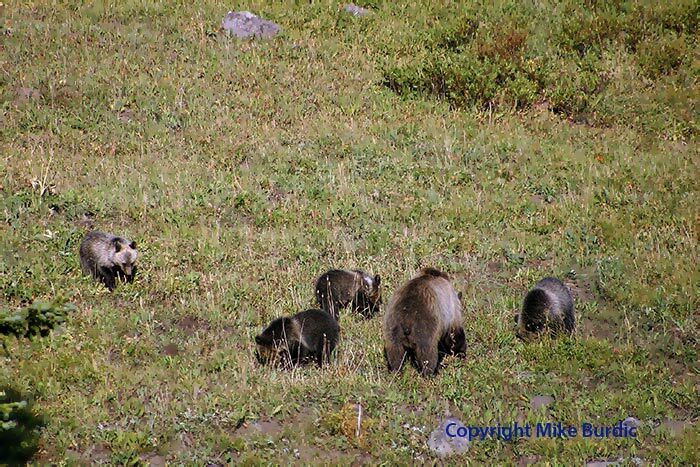 Salle Engelhardt published your photos with Mr. Maughan on August 19th, but I had previously seen the sow with three cubs in July on the South side of Mt. Washburn. On September 15, 2007 we learned that she had shown up on Dunraven the previous week with only three cubs but presently had only two with her (her original two) as the third and fourth cubs had gone missing. A single (lost?) cub had been sighted late the 15th and during the day on the 16th and 17th and she had been sighted during those days with two cubs. At about 3PM on the 17th, about a mile below the Washburn trailhead several of us were blessed with the reunion of she, her two cubs and the (lost?) cub. The (lost?) cub came running, bawling and crying, from about a quarter of a mile downhill from she and her cubs and the reunion was one of the most wonderful things I have ever witnessed in the wild. All four bears were crying, rolling around, hugging (the only word I can think of to describe the scene) and sniffing. She gathered up her brood and clearly began looking for a way to cross the road, (from uphill down). She, her cubs and the crowd traveled uphill to just below the trailhead before we were able to stop the crowd and make a safe place for her to cross. She crossed and went downhill from the trailhead. Also, if you run into Ranger John Kerr up there he has been working this bear since early summer. This man is the poster child for what a park ranger should be, very calm in situations with tourists which would probably land me in jail and he has a bunch of information on her goings on. Too bad Mike’s photos aren’t available here. He has some very nice photos of wildlife in general and tons of moose photos from the area. I am also hoping to catch one more eyeful of the “bear bunch” before the season ends. So does that mean all the cubs are with their rightful mothers???? if so that would be neat. In July I got to witness a sow and two cubs just North of Mt Washburn, such beautiful creatures. The “rightful mother” theory isn’t in the works, it seems. The story don tells above is that the sow seems to have misplaced one of the four but has since recovered it to her custody. She still has four cubs. Hmmm. Maybe she only has three now. Hope they all are still well and hanging together. was all around dunraven a couple weeks ago, saw lots of wolves but no sign of the grizzly bears.